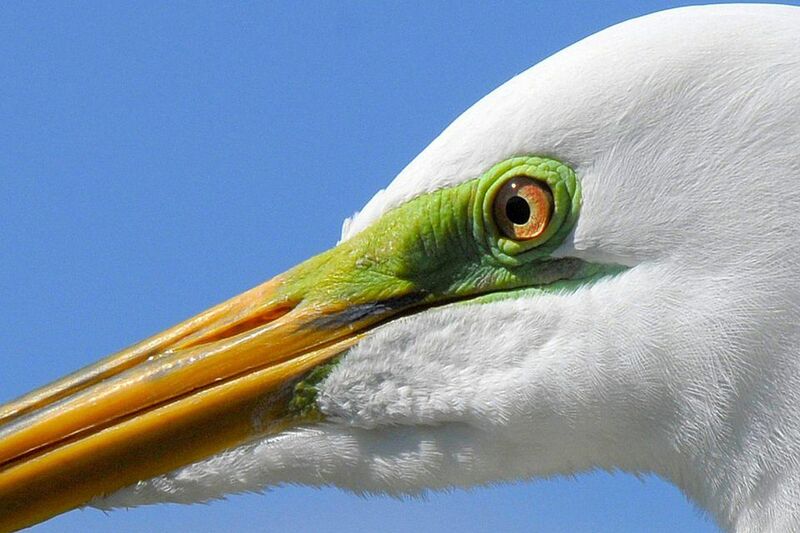 The lores are the areas of a bird's face on either side from the base of the bill to the front of the eyes. The lores do not extend further up or down than the width of the bill base. While the lores serve no known distinct function other than being part of a bird's facial structure, they are important to birders. The color and distinction of the lores can be used for proper bird identification or can give clues about a bird's mood or behavior. Carefully observing lores on different bird species can help birders sharpen their observational skills by noting minute, subtle differences in the size, shape and color of lores. In addition to lores on birds, the area between the nostrils and eyes on snakes and reptiles is also called the lores. Nares: The bird's nostrils, or nares, are found on the bill in front of the base rather than on the face behind the bill in the lore region. The nares are distinct openings that vary in shape and size, while the lores are just a general facial region. Cere: Some birds, including pigeons, doves, parrots, and raptors, have a fleshy patch covering the base of the bill. This cere may be similar to the lores in color and texture, but the two structures are distinct. Eye Ring: The eye ring, or orbital ring, may be either bare skin or feathers, and encircles the eye but does not protrude into the region of the lores. While it is an adjacent structure and may be the same color and so could seem connected, it is not part of the lores. Eye Stripe: This is a colored marking that can run completely or partially through the lores but is not part of the structure of the bird's face. Not all birds have eye stripes, eye lines or other facial markings, but they all have lores. Rictal Bristles: Fine, hair-like or thin stiff feathers that protrude from the base of a bird's bill are the rictal bristles. While they may be connected to the lores or may form a fringe near the lores, these feathers are not part of the lores themselves. Gape: The area where the upper and lower mandibles join is the gape and is part of a bird's bill structure. It is directly in front of the lores but is not a part of the lores' structure, though it may be a similar color if the lores are bare skin. Basal Knob: Some birds, particularly certain waterfowl species, have a swollen bump at the base of the bill. This is a basal knob, and while it may be next to the lores, it is not connected to the same facial structure and is not part of the lores. This area can be critical for the proper identification of bird species with different facial markings. The lores may show a different color, a stripe or naked flesh that can be useful to properly identify birds. In many species, such as different types of vireos the color of the lores may connect to eye rings, eye lines or other markings around the eyes for a "spectacles" effect that can distinguish different species. In other cases, such as with waxwings, the color of the lores extends across the face to encompass the eye and create a mask-like pattern. In birds where the lores are bare flesh, the shade and intensity of the color can vary. Depending on the species, this may indicate breeding plumage or mating readiness, general aggression or external irritation, such as pollution or other stress. When examining the lores for bird identification, check for colors, tones or hues that differ from other facial markings. Note the width of any stripes or streaks on the lores, especially how those markings change in shape closer to the bill base or closer to the eyes. Compare the color and shape of the lores any other eye stripes or markings below, above or behind the eyes to help clarify a bird's identity. What Is a Turkey's Snood? What Is a Wing Bar and Can It Be a Field Mark for Bird Identification? What Is a Bird's Nape? See That Bump on a Bird's Bill? It is a Basal Knob - Learn More!